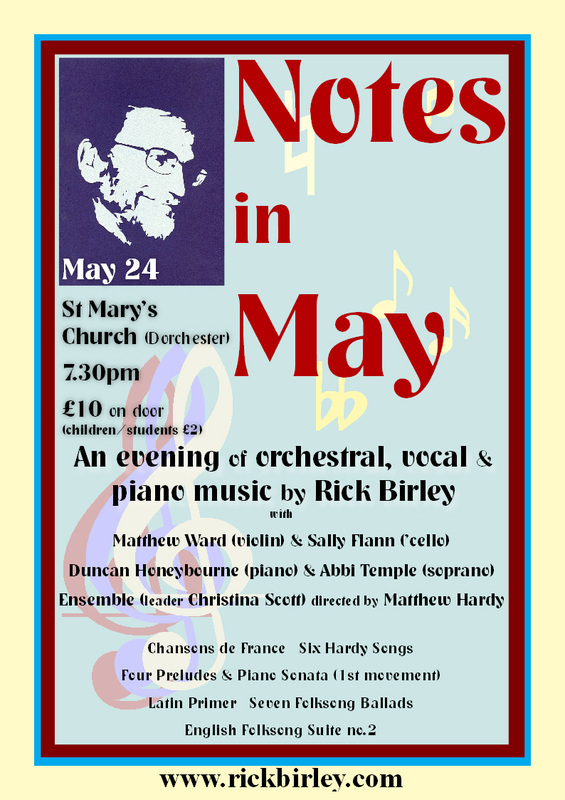 Thanks to a generous donation by the Occasional Singers (to mark my stepping down as director) I am organising a concert to celebrate my sixtieth birthday, in St Mary's Church on Saturday, May 24th, 2014. The soundfiles below are what will be performed (along with Six Hardy Songs, with Abbi Temple (soprano) & Duncan Honeybourne (piano)). Matthew Hardy will direct the performances; I, for once, will melt into the audience background and enjoy a relaxing listen! The ensemble comprises 22 excellent musicians; these files are for them to access as they learn their individual parts. Rearranged for the fourth time! Click here for a link to the original page & notes. This, too, is a rearrangement. There is not the percussion of the original. Click here for a link to the original page & notes. Originally composed for soprano and string quartet, these have been rearranged for different ensembles over the years. Click here for the link to the original page & notes. And here, as a replacement for the Ensemble to play if Abbi still has not recovered for the concert, are three transcriptions of motets I composed in 1991: Sing Bravely, Inward Light, and Vertue.